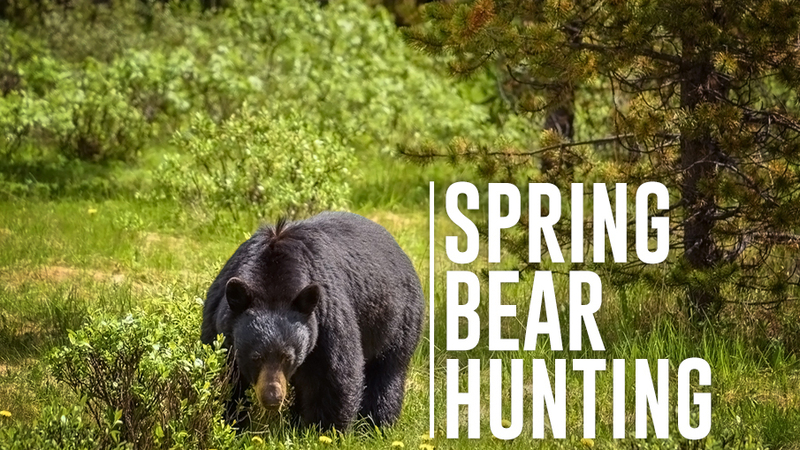 You don't have to wait until fall to chase big game, spring bear season is here to ease that hunting itch. Tune in to The Revolution this week as we discuss spring bear hunting with a panel of experts. Don't miss tips on spot and stalk hunting, baiting, the best states for spring bear hunting action and much more! Joining us will be Mike Stroff host of Savage Outdoors and Nicole Reeve of Driven with Pat & Nicole. Also phoning in will be Jerry Courtney from Ranch Hand to talk about outfitting your rig with their products. The Revolution is presented by Outdoor Channel, Sportsman Channel, World Fishing Network and MyOutdoorTV. When the word “bait” is used, many people often assume that means an easy hunt. However, when it comes to bear hunting, using bait doesn’t guarantee your success. Mike Stroff, host of Savage Outdoors on Sportsman Channel, tells Jim and Trav big bears are smart and that a baited hunt can be just as tough as a spot and stalk hunt. He says spring bear hunters have to hunt smart and watch the wind. Although bears may be accustomed to coming in to a bait sight on a regular basis, but when they feel, smell or see something slightly amiss, they will hold off. Thus, hunting bears over bait requires patience and skill to accomplish. Mike will also talk about the advantages of using iron sights and how quick and easy sight acquisition makes them a great choice under the right circumstances. Furthermore, Mike will discuss field judging bears and how a baited hunt can, in many cases, make it easier to judge size and pass on smaller bears than a spot and stalk hunt would. Finally, Mike will recount a very physical hunt for mountain grizzlies in the Brooks Range of Alaska where he chased a bear for miles and eventually lost sight of it. However, a last-minute look before heading back to camp revealed the bear was within close proximity and Mike will explain how he was able to close the deal. Tune in for this fun and informative two-part interview with Mike Stroff and to find out what’s to come this season on Savage Outdoors. An archery spot and stalk hunt for Alaskan brown bears is a big undertaking. Nobody knows that better than Nicole Reeve, co-host of Driven with Pat and Nicole on Outdoor Channel. Nicole joins The Revolution this week to talk bear hunting and more specifically, her quest for an archery Alaskan brown bear. Starting from a good vantage point, Nicole says they glassed and saw a lot of bears before spotting the one she would be pursuing. When brown bear hunting, you really only get one chance, she says, because once you leave your spotting location, you lose your visual of the bear. Nicole tells Jim and Trav from that point, it was all about guessing the bear’s next move and out maneuvering him. With the help of her guides, Nicole says they traversed challenging swampy terrain and ultimately came out at the right time and place to ambush the bear. Being up close and personal with a huge bear can be intimidating for anyone, especially when your weapon of choice is a bow. However, Nicole says there really wasn’t time to be nervous, at only 15 steps away she knew that a well-placed shot and the fact that she only got one chance, kept her focused. Tune in to hear Nicole’s story where she’ll also talk about the challenge of hunting remote locations. Every driver is different. Are you a city guy, country bum, rancher or off-roader? The demands of a vehicle are unique to the driver and regardless of whether your tires spend more time on dirt or pavement, one thing is certain, protection is universal. Everyone can benefit from the extra protection that accessories like grille guards and bumpers provide. In urban and suburban settings, these accessories can safeguard you and your vehicle, both front bumper and back, from other drivers who are riding a little too close. In a country setting, these accessories can prevent extreme damage to your vehicle if an animal happens to step in front of your path. There is no doubt that having, at the minimum, a grille guard installed on your vehicle can really help you out. This week on The Revolution, Jerry Courtney from Ranch Hand joins us with an in-depth look at grille guards and bumpers and talks about the practical applications and benefits of installing these accessories on your truck or SUV.